The coverage of LoRaWAN public networks made a surge but is not currently complete, particularly for indoor locations. Actually, more than 85% of outdoor’s field is covered, but as soon as we are inside a building, those numbers tend to decrease significantly. INEO-SENSE offers the solution to make the signal going out from deep underground. In the case study « Building Absorption and the RF Loss through Glass » conduct by APWPT, an experiment has allowed to show the radio intersertion losses of building materials. The study proves that for a 2 layers brick with empty space wall the insertion loss is ~10dB and even a simple double-glazed window with silver coating induces 20dB attenuation. The literature reports RF attenuation values of 15 dB for armed concrete with a thickness of 2.5cm, and up to 35 dB for a thickness of 30cm. We can easily deduct from this study that a succession of walls, windows and floors would quickly impact the quality of a radio signal. Therefore the RF attenuation in an entire building could reach 100dB, depending on the number, material and thickness of internal walls and doors. Those facts has for consequence to feed the doubts of the industrial actors regarding the actual capacity of LoRa solutions for indoor applications. This is explained by the fact that LoRaWAN’s public network is definitively not adapted for constrained locations like undergrounds or even in buildings with thick walls. As we can see in the figure below, an antenna is installed on the roof and from the moment of the signal penetrates a wall, it is weakened; it only takes 2 floors to loose 30 % of the signal. Of course, LoRa operators propose solutions to extend the network but these come in return of technical constraints, as welle as financial impact with unamortized extracosts, espacially when installation is only about few sensors. INS-Extender device allows to fill this lack of LoRaWAN coverage. More specifically, it connects to the public network and act as a “repeater” for Clover-Net enabled end-points (UPLINK, but also DOWNLINK). Self-powered, INS-Extender device does not require any wiring and is thus particularly easy to install. Besides, the end-devices communicate data to INS-Extender, which then communicates in LoRaWAN. Moreover, this approach allows to mutualize the LoRaWAN subscriptions and thus decrease the operation costs. Henceforth, it is possible to set up a deep indoor LoRaWAN infrastructure without the worry of lacking coverage, all of this at an affordable price and without any technical complications. 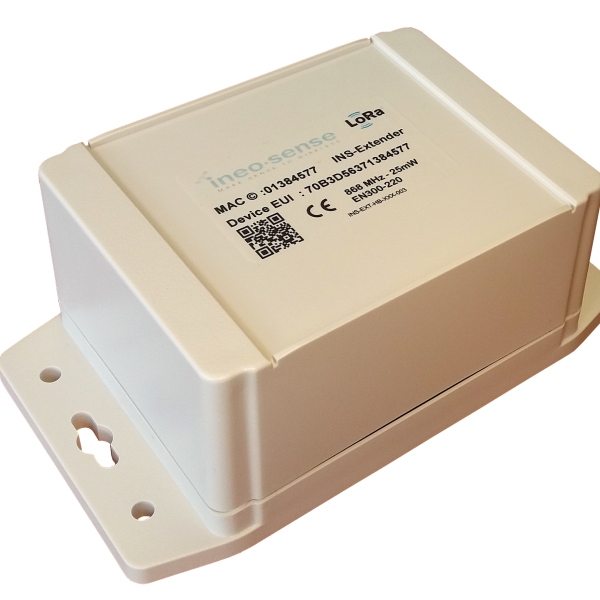 Visit the <a href=”http://www.ineo-sense.com/portfolio/ins-extender/”>INS-Extender device page</a> for more information.